ENGLAND'S ICONIC MODERNIST EVENT IS BACK! Brighton Beach started in 1994 at The Cockpit in Leeds, aimed at playing classic 60’s mod and soul tracks alongside the great British bands of the time, and as Britpop emerged, the night could not have been better timed. Before long, Supergrass, Shed Seven and other bands were hanging out at the club and performed frenzied secret gigs there too, Local heroes the Kaiser Chiefs spent much of their formative days at the Beach before forming a band. Shortly after the night began, DJs from the vinyl obsessed, underground UK 60’s scene were brought in to host a second room at the club, playing pure Northern Soul, R&B, Jazz and Freakbeat introducing fuzzed up garage and speed fuelled psych to salivating kids. On the dancefloor, Mods from the local Scooter clubs were teaching the new Britpop scenesters how to dress and dance, with tight ties and perfect hair. In the past, Brighton Beach had monthly residencies in Sheffield, Newcastle, Leeds and now, the legendary club night returns to The Wardrobe in Leeds for it's 21st anniversary! 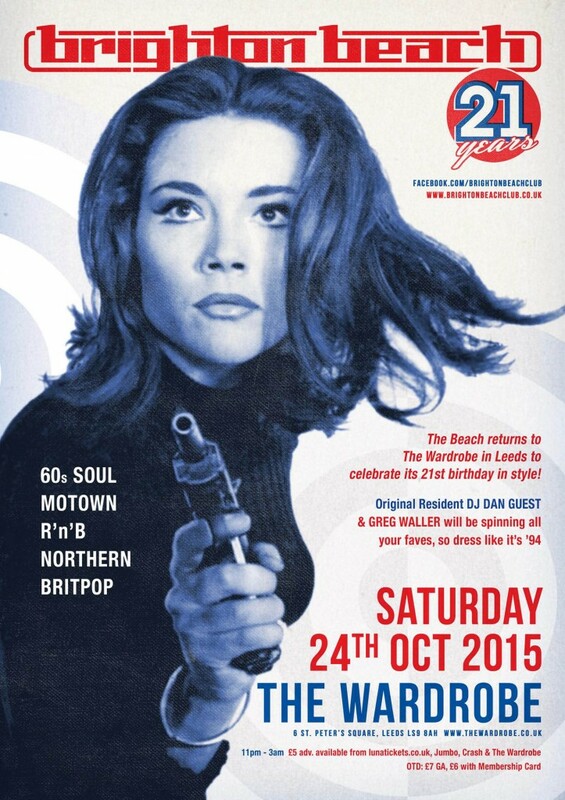 We’ll be retaining the classic Brighton Beach music policy with two rooms of pounding 60s soul, Motown, Indie, Northern Soul and Britpop. It’s going to be one hell of a night!